Attribution-Share Alike 2.5 Generic license. Holly: Hi, I’m Holly Strand. Together with poinsettia and holly, mistletoe is an iconic Christmas plant. The term mistletoe doesn’t refer to a single species or even a single lineage of plants. Instead there are over 1300 species belonging to 5 different plant families. All mistletoes are partially or mostly parasitic –they obtain water and minerals from a host tree, shrub or cactus via specialized stems. Sometimes mistletoe stems may branch into tangled masses called witches brooms. These gnarled structures offer nesting habitat for songbirds, raptors, and squirrels and can provide forage for deer and elk. 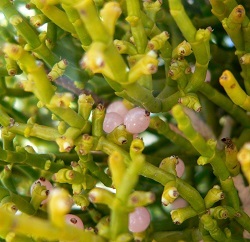 In Utah, Juniper mistletoe is the most common species. 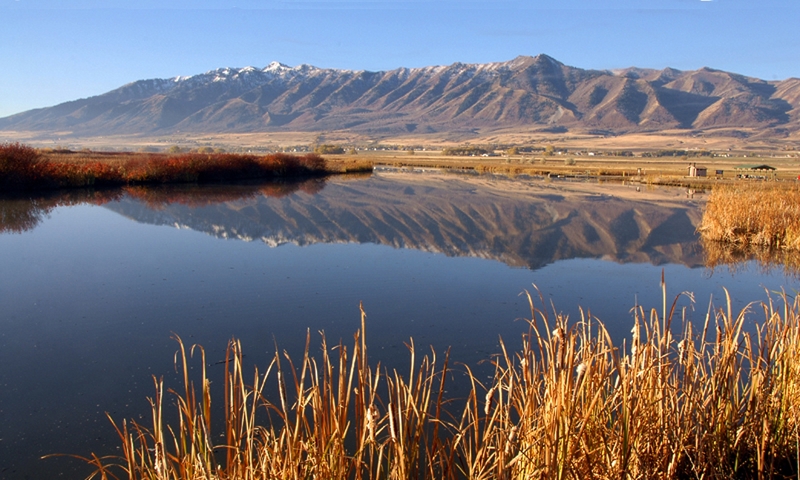 You’ll find it across the Colorado Plateau and along the Wasatch Front. 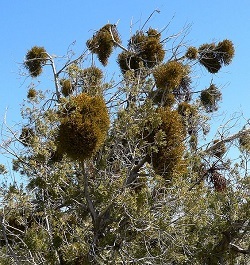 Acacia mistletoe is much rarer and found only in the Beaver Dam Mountains west of St. George. Both of these species are leafless and spiky looking but many types of mistletoe have green leaves to support photosynthesis. Most mistletoes reproduce with the help of birds that eat their fruit. Mistletoe seeds pass through the bird’s digestive system and are deposited on new branches where they stick and germinate. This explains the mistletoe’s strange name which is Anglo Saxon for “dung twig”. Considering its humble origins in bird poop, mistletoe has made quite a name for itself. Like a botanical Forest Gump, it keeps cropping up throughout history in myths, cultural traditions and even medicines. In Norse mythology, the overprotective Goddess Frigg went to all the living creatures on earth, making them pledge not to harm her beloved son Baldur. But she overlooked the mistletoe. When mischievous Loki discovered this, he arranged that Balder’s brother would throw an arrow made of mistletoe to strike Balder—killing him, of course. In Virgil’s epic poem the Aeneid, mistletoe was the “Golden Bough” which allowed Aeneas to pass into the Underworld. The ancient Druids revered both oak trees and the mistletoe that grew in them. They believed that a potion prepared from mistletoe would make barren animals reproduce. And they used mistletoe as an antidote to all kinds of poisons. Throughout the ages, mistletoe was used to treat many medicinal conditions such as epilepsy, infertility, hypertension and arthritis. Today, many claim that mistletoe stimulates the immune system, helping the body fight more efficiently against cancer and other diseases. While it was originally hung in doorways to attract good health and good fortune, by the 18th century mistletoe morphed into a Christmas decoration. We don’t know exactly how the custom of kissing under the mistletoe –or dung twig—evolved, but I’m certainly glad it did! 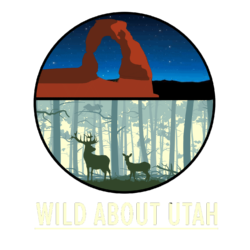 For pictures and sources for this program and archives of past programs, go to www.wildaboututah.org For Wild About Utah, I’m Holly Strand.